looks sensational. It tells the tale of the rivalry between two Hollywood legends, Joan Crawford and Bette Davis. It brings to mind Whispers part in making the movie based on Joan Crawford's life, Mommie Dearest into a minor world-wide hit. The film was based on a book by Crawford's adopted daughter Christina Crawford. It was the late 1970s and Whispers accompanied then Daily Express columnist Timothy Swallow (left) to New York to produce a book about famous women. We ensconced ourselves for a fortnight at the Waldorf Astoria. Our madcap adventures in that two weeks are for another time but one incident has now become a legend. 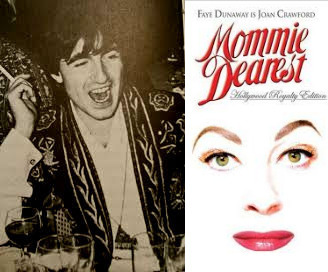 Timothy and I on a free afternoon ventured over to a Times Square cinema to watch Mommie Dearest staring Faye Dunaway. The movie was languishing in the box office doldrums and the Hollywood "elite" had turned their backs on Dunaway claiming her brilliant portrayal of Crawford was some sort of betrayal. We simply loved the movie and early that evening over drinks in a bar in the Waldorf we created a tale for Timothy's column in the Express: the William Hickey column. We claimed groups of fans were turning up to watch the film and at the crucial moment when Crawford attacks her children with a wire coat hanger, the fans stood up and waved their own wire coat hangers. Silly stuff to fill a column. Within days the tale was front page news around the world and life imitated art : fans began to do just that. The film became a minor box office hit and a year later back in London a producer tracked us down and took Timothy and I to the uber smart Knightsbride eatery San Lorenzo for lunch to thank us. Former Vanity Fair editor Tina Brown later recounted our story in her book 1983 book Life As a Party. Below is a trailer for Feud and beneath the infamous scene from Mommie Dearest.